On January 13, 2018, the Ice Hotel will return for a limited time in the Ice Village. 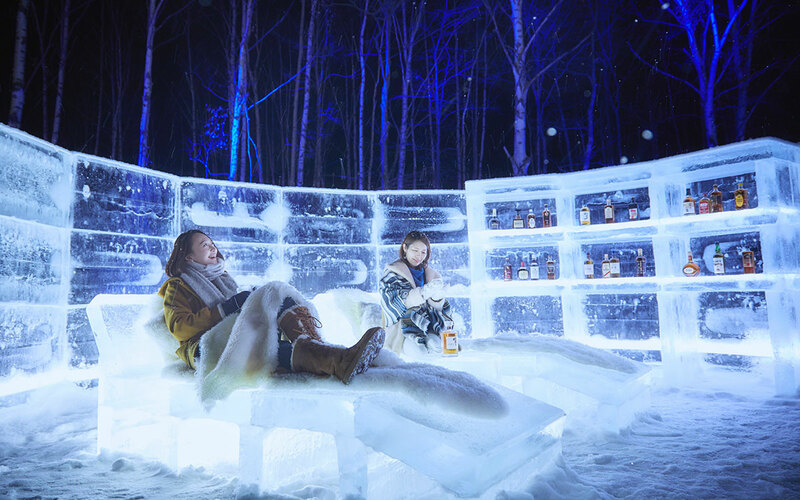 In addition to the Ice Hotel's ice beds and Arctic Bath facing the white birch forest, this winter, we introduce our Ice Lounge where you can fully enjoy the world of ice. 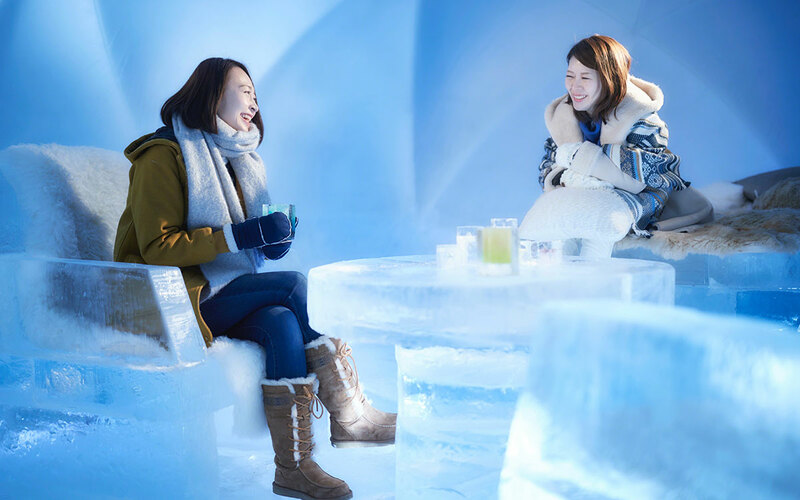 Please enjoy the ice world experience with this one group per day accommodation. 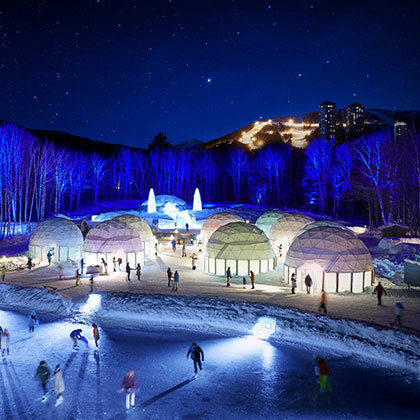 The Ice Hotel has a seamless dome made from a single sheet of ice and is a quiet area where you can fully enjoy your stay. 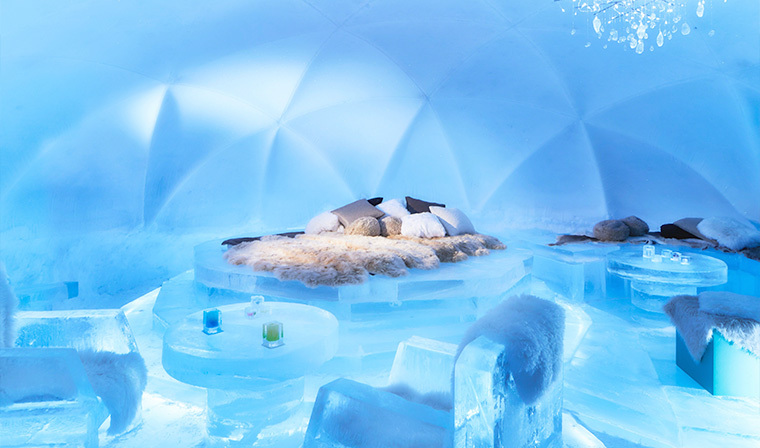 Inside the rooms, there are beds, chairs, and tables all created with ice. You can comfortably have a good night's sleep at bedtime by using our special sleeping bags which can handles temperatures 30°C below zero. 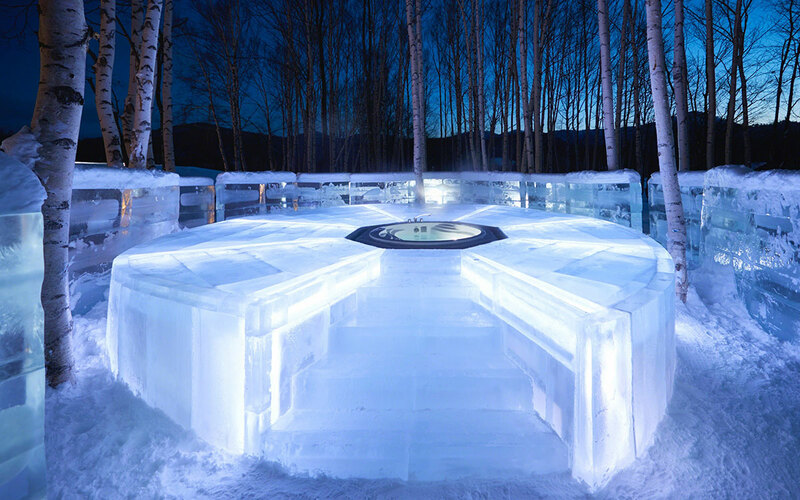 In this outdoor bath area surrounded by ice, you can enjoy the view of the white birch forest. Once you get into the bath, a transparent icy area is presented before your eyes. Please enjoy the tranquil winter forest while being warmed by the hot bath. There is also a heated dressing room, so no worries about feeling cold after your bath. After warming in the bath, please wear warm comfort wear and relax in the surrounding icy area. With a strong glass of whiskey, you can enjoy the world of ice without feeling cold. Please enjoy all you can from our Ice Whiskey Cellar which contains 20 Japanese whiskeys. We also prepare honey infused ice to use for those who dislike a strong alcohol flavor. One night in the Ice Hotel, Arctic Bath, Ice Lounge, whiskey, morning coffee and snacks, insulated sleeping bag, and pajamas. * There maybe instances where due to weather conditions such as temperature rise that leads to the Hotel being unusable. How cold is it approximately? Inside of the Ice Hotel is around -6°C, while the temperature outside in the morning could get down below -25°C. If I would like to quit halfway, what should I do? Please tell the front desk of the hotel you are staying in. They will come to the Ice Village to pick you up. Why is it limited to guests staying at Hoshino Resort TOMAMU? Due to any emergency needs that may arise under the extreme cold, it is required by law that all guests should be staying at the Hotel. The temperature along the route starting from the arrival at the Ice Village to the Ice Hotel, and the interior of Bar Icewood sometimes could get below -10°C, so please wear warm clothing. Knitted hats, ski-wear jackets, warm fleece, down coats, tights, and warm socks are recommended. For sleeping, special pajamas and sleeping bags designed for extreme cold are prepared for you. What kind of amenities are available? Sleeping bags that can cope with temperature down to -30°C, Ice Hotel special pajamas and slippers, towels, pots with warming hot water and black tea are prepared for you. The street of ice that only appears during winter in TOMAMU -- the Ice Village. The fantastical scenery that opens up only under the -20°C environment in TOMAMU. * Further details will be announced on the featured website at the end of September.